Any fishermen, (or those maybe just interested), who would like to be included on an e-mail group list, for direct notification of latest information, are encouraged to contact me so your name can be added. SFCC members only please. Thank you. Russ - SFCC Publicity & Website Administrator. Please click this link for Angling Trust's official line on what the 2017 regulations will be. For recreational fishermen the rule remains exactly the same as 2016. That is, 'Catch and Release' only from January - June, and 1 Bass per angler per day, from July to December. Minimum size 42cms. Russ - Publicity and Website Coordinator. Bass, Wrasse & Black Bream Competition. The above took place on the weekend of 10th/11th September. Despite the good conditions only one Bass, and one Wrasse were recorded, with no Black Bream caught. Kevin Rouse wins the Wrasse Cup with a Ballan Wrasse of 3 lb-9oz. Kevin then made it a double, with a fine Bass of 4lb-8.8oz, which also gave him 10pts on the Competition Accumulator. 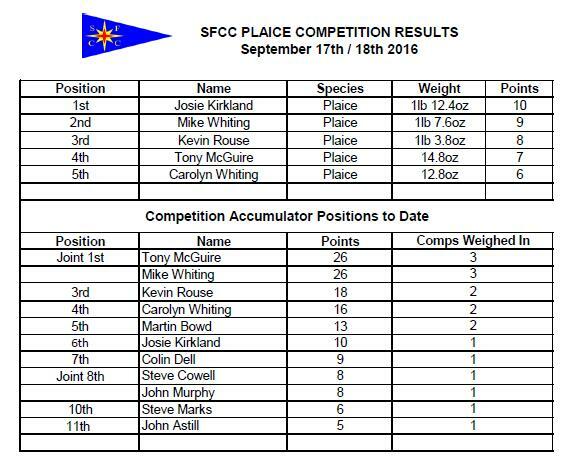 The last competition of the season, for Plaice, was fished on the weekend of 17th/18th September. On the Saturday two fish were weighed in. I had a a Plaice of 1lb 7.6oz and Tony McGuire had another of 14.8oz. On Sunday there were a lot more boats out fishing, with three Plaice were weighed in. My wife Carolyn caught her first ever Plaice which weighed 12.8oz, (and returned alive). Kevin Rouse weighed in a fish of 1lb 3.8oz, but the best Plaice of the weekend was caught by Josie Kirkland, and weighed 1lb 12.8oz. So the final 10 accumulator points go to her. A big thank you to all of you who fished over the weekend, and all the previous competitions too. Mike Whiting - Fishing Secretary. The Comp this weekend has been postponed due to the weather. Will now take place on 10th and 11th September. Fishing for Bass, Bream, & Wrasse. 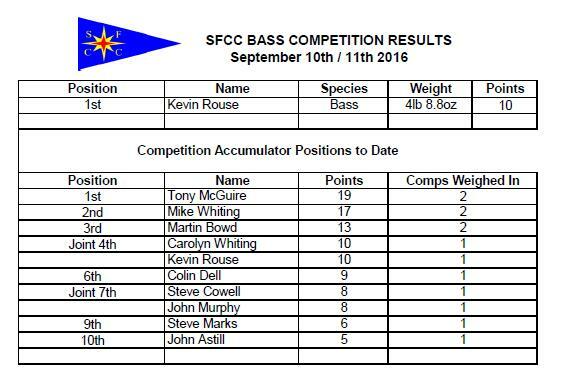 Points awarded in the Accumulator for Bass & Bream. Saturday 3rd September and Sunday 4th September. The next competition is scheduled to be Bass, Wrasse and Bream, combined. Please remember that no Bass may be retained in the River Exe Bass Nursery Area, and outside of this area only 1 Bass per angler, per day, may be retained. Minimum retention size limit for Bass is 42cms. Then on Saturday 10th September it is the Newton Boat Jumble, (please click this link to get their page). Last scheduled Comp is then on Saturday 17th, and Sunday 18th September. This is the Plaice Competition. Minimum retention size limit for Plaice is 27cms, and the 100% Specimen weight is 4lb 0oz. Sunday 31st July saw the latest fishing competition take place. It was the annual match between SFCC and Exmouth Deep Sea fishing Club, competing for the JOHN HALL TROPHY. The winning team is decided on the best two specimen fish caught by each club. The conditions in the morning were ideal for fishing, but the wind picked up later in the day. This year the trophy has been won by EDSFC (only borrowed! ), with a two fish specimen percentage of 186.25%. This was made up of a Lesser Spotted Dogfish, which weighed 2 lb 4oz (75%), caught by Peter Cloak, and a magnificent Ballan Wrasse of 5lb 9oz (111.25%), caught by Gareth Awberry. In reply SFCC managed a two fish specimen weight of 138.10%. Josie Kirkland caught a nice plaice of 2lb 14.1oz (64.80%), and I caught a Dogfish weighing 2lb 3.6oz (73.30%). EDSFC hosted the presentation and social evening, held at Exmouth Sailing Club, which was well attended by SFCC members. We were served Fish, Chips, and Peas, which everyone agreed was delicious. John Astill did complain that he did not have any bread & butter to make a chip butty!! After the meal, I made the presentation of The John Hall Trophy to Gareth Awberry, and explained it’s only on loan till next year. The evening continued with a spot of Roulette, on which, I am happy to say, a bottle of champagne was won by SFCC member Becky Le Milliere. SFCC would like to say a big thank you to EDSFC for a lovely evening, and we look forward to winning the trophy back next year. 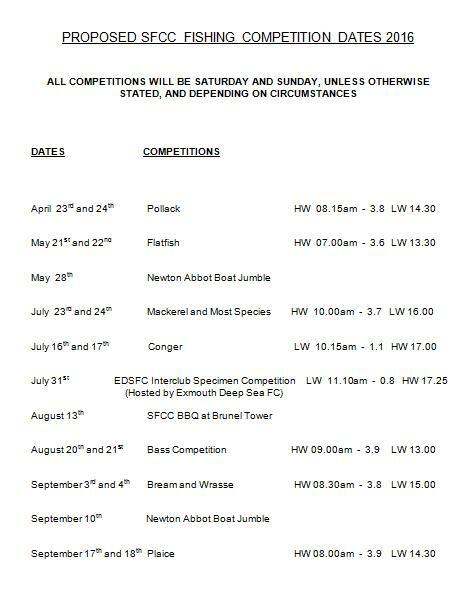 The Conger Eel Competition was fished on the 16th-17th July. The first day saw only one eel recorded. This was caught by Tony McGuire and weighed 10lb. Although not very big, it did manage to get its jaws around Tony’s thumb. OUCH !!! Sunday saw some better eels caught aboard John Astill's boat, J's Pleasure. John had one of 23lb, but this was beaten by Steve Marks with a fish of 27lb. Bill Searles had one of 10lb. During the competition there were a couple of other fish caught, and worthy a mention. Tony McGuire landed a lovely Bass which weighed about 7.5lb and John Astill had a new club record Tope, (caught since the year 2000), which weighed 26lb. Well done everybody. 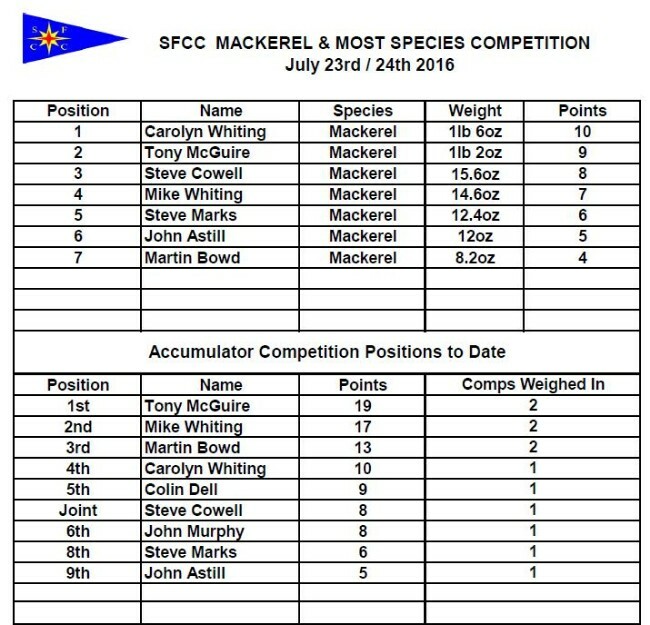 The latest competition to be fished was the Mackerel & Most Species, with Accumulator points awarded to the best Mackerel. Fished on the weekend of 23rd-24th July at least seven boats and 16 people took part over the two days. The winning fish were all caught on the first day. The Most Species winners were Steve Cowell and myself, who both had five species each. Steve caught Mackerel, Dogfish, Gurnard, Pout Whiting and Wrasse. I had Mackerel, Dogfish, Pout Whiting, Wrasse and a Conger. There was several good size Mackerel weighed in. The heaviest was caught by Carolyn, my wife! It weighed 1lb-6oz giving her 10 points on the Accumulator. 2nd was Tony McGuire with a Mackerel of 1lb-2oz, and 3rd Steve Cowell with a fish of 15.6oz. Several others were also recorded and will gain points in the Accumulator too. So, after some cancellations due to poor weather, the first two Comps, which also included accumulator points, have now been fished. The next competition is scheduled for 16th/17th July, and is the Conger Comp. There are no accumulator points given for this competition. Then on the 23rd/24th July it’s Mackerel and Most Species. The Mackerel gains points in the accumulator, so please get something recorded!! As for the most species, all you need to do is make a note of the fish caught and return them alive if not being kept to eat. Then simply record them all on the board in the Fish Room. Taking a photo of any species you’re not sure about will count as good. The Flatfish Competition got underway on the weekend of 4th/5th June, and was the first Flatfish Comp for many a season that saw no Flounders weighed in. I was unable to take part, but have it on good authority that the weather was quite reasonable. This allowed the boats to get out of the estuary and fish for Plaice off Straight Point, and along the front of Dawlish. Again fish were hard to come by, and no fish were recorded on the Saturday. Sunday however, saw three Plaice brought to the scales; the best was caught by Tony McGuire, caught aboard his own boat, ‘Day Tripper’, and weighed 2lb 2.4oz. John Murphy weighed in a fish of 1lb 4.2oz, which was also caught aboard Tony’s boat. But he was pipped by a fish of 1lb 8.4oz caught by Martin Bowd on ‘Little Anthem’. The Pollack Competition took place on the weekend of 14th/15th May. At least eight boats managed to get out on the wrecks over the two days, with around eighteen people taking part. Pollack were very hard to come by on the Saturday. Only two fish were recorded. I managed to catch a fish of 5lb 4.4oz, caught aboard Colin Dell’s boat, ‘DreamCatcher’. Colin managed to pip me with a fish of 5lb 5.8oz. The second day was even harder, with only one fish making it to the scales. This was caught by myself, and weighed in at 8lb 13.2oz, giving me ten accumulator points. There were reports of Pollack being caught, but not weighed in. This could of cost someone at least eight points in the accumulator. Unfortunately, the weekend did not go according to plan for all. Four fishing aboard John Hall’s boat, ‘Blue Mist’, were unable to fish, as the boat developed a mechanical problem and was towed back to Exmouth. I hope it was not too serious John !! 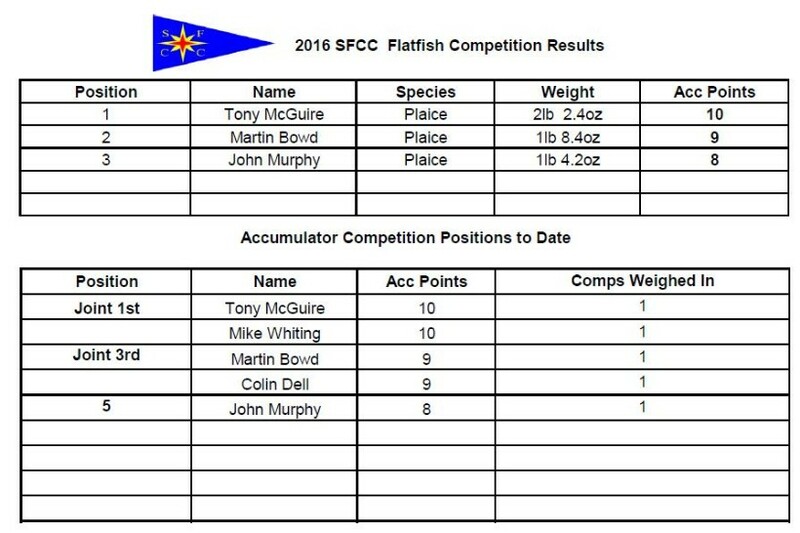 New dates planned for SFCC Flatfish Competition are Saturday 4th June, and Sunday 5th June. All are reminded that there is no weigh-in time on Saturday, but it is to be by 18:00 on Sunday. It's on Saturday 28th May. Please click this link to get their page. New dates planned for SFCC Pollack Competition are Saturday 14th May, and Sunday 15th May. 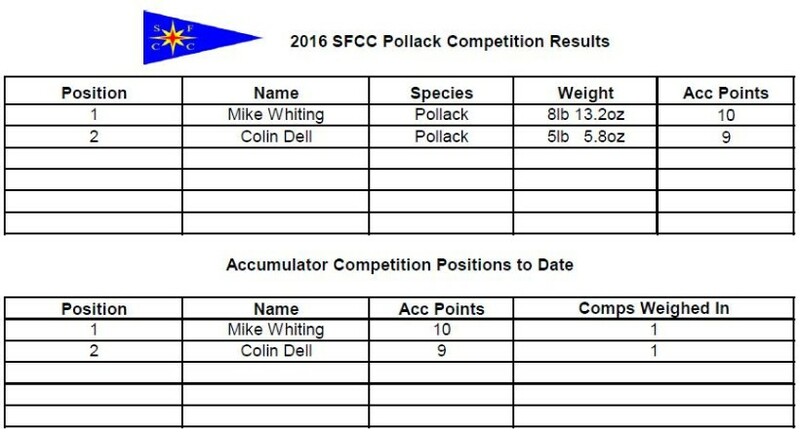 New dates planned for SFCC Pollack Competition are Saturday 7th May, and Sunday 8th May. Please link below for current SFCC Fishing Trophies, and Fish Records. Further restrictions apply in 2016, especially for non commercial fishermen. Best you know where you all stand, before you think about filling your fish boxes. Our local Devon and Severn IFCA (Inshore Fisheries Conservation Authority) are slow in advising the current regulations, (IFCA Cornwall already have), so I can only link you to the latest Gov.UK webpage, where it explains what the new regulations will be. Not negotiable for recreation anglers, but with exceptions for certain commercial fishing methods, it seems. Please find image here, but if you require a download you will find one on 2016 Fishing Schedule page. The link is at top of this page. With the new season approaching, Fishing Latest webpage has been stripped back, and is now awaiting for things to say. Previous Fishing Latest reports can still be found online, simply by calling them up.